In finance and accounting, equity is the value attributable to the owners of a business. 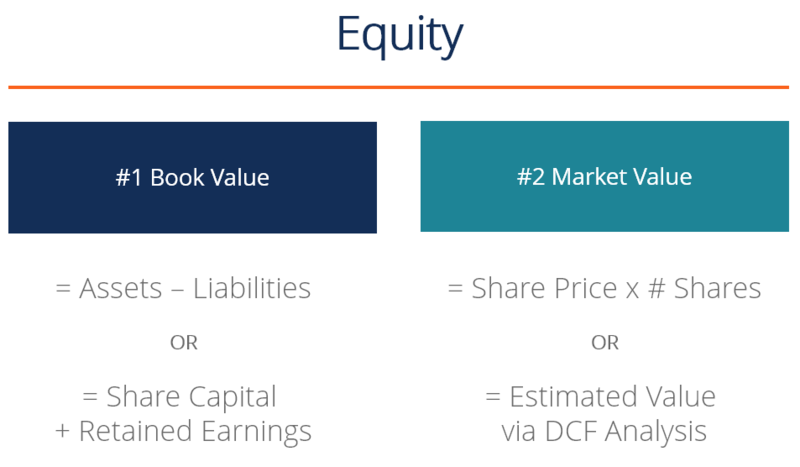 The book value of equity is calculated as the difference between assetsTypes of AssetsCommon types of assets include: current, non-current, physical, intangible, operating and non-operating. Correctly identifying and classifying the types of assets is critical to the survival of a company, specifically its solvency and risk. An asset is a resource controlled by a company which future economic benefit and liabilitiesTypes of LiabilitiesThere are three types of liabilities: current, non-current, and contingent liabilities. Liabilities are legal obligations or debt owed to another person or company. In other words, liabilities are future sacrifices of economic benefits that an entity is required to make to other entities as a result of past events or on the company’s balance sheetBalance SheetThe balance sheet is one of the three fundamental financial statements. These statements are key to both financial modeling and accounting. The balance sheet displays the company’s total assets, and how these assets are financed, through either debt or equity. Assets = Liabilities + Equity, while the market value of equity is based on the current share price (if public) or a value that is determined by investors or valuation professionals. The account can also be called shareholders/owners/stockholders equity or net worth. In accounting, equity is always listed at its book value. It is the value that accountants determine by preparing financial statementsThree Financial StatementsThe three financial statements are the income statement, the balance sheet, and the statement of cash flows. These three core statements are intricately linked to each other and this guide will explain how they all fit together. By following the steps below you'll be able to connect the three statements on your own. and the balance sheet equation that assets = liabilities + equity. The equation is rearranged to be equity = assets – liabilities. The value of a company’s assets is the sum of each current and non-current assets on the balance sheet. The main accounts include cash, accounts receivable, inventory, prepaid expenses, fixed assets, property plant and equipment (PP&E), goodwill, intellectual property, and intangible assets. The value of liabilities is the sum of each current and non-current liability on the balance sheet. Common accounts include lines of credit, accounts payable, short-term debt, deferred revenue, long-term debt, capital leases, and any fixed financial commitment. To fully calculate the value, accountants must track all capital the company raised and repurchased (its share capital), as well as its retained earnings, which consist of cumulative net income minus cumulative dividends. The sum of share capital and retained earnings is equal to equity. In finance, equity is typically expressed as a market value, which may be materially higher or lower than the book value. The reason for this difference is that accounting statements are backward looking (all results are from the past) while financial analysts look forward into the future to forecast what they believe financial performance will be. If a company is publicly traded, the market value of its equity will be easy to calculate, it’s simply the latest share price multiplied by the total number of shares outstanding. If a company is private, it’s much harder to determine its market value. If the company needs to be formally valued, it will often hire professionals such as investment bankers, accounting firms (valuations group), or boutique valuation firms to perform a thorough analysis. If a company is private, the market value must be estimated. It is a very subjective process, and two different professionals can arrive at dramatically different values for the same business. In the discounted cash flow approach, an analyst will forecast all future free cash flow for a business and discount it back to the present using a discount rate (such as the weighted average cost of capital). It is a very detailed form of valuation and requires access to significant amounts of company information. It is also the most heavily relied on approach, as it incorporates all aspects of a business. To learn more, read CFI’s guide to business valuation resourcesValuationValuation refers to the process of determining the present worth of a company or an asset. It can be done using a number of techniques. Analysts that want. The concept of equity applies to individual people as much as it does to businesses. We all have our own personal net worth, and a variety of assets and liabilities we can use to calculate the net worth. The difference between all these assets and all these liabilities is your personal net worth. Let’s look at an example of two different approaches in Excel. The first is the accounting approach, which determines the book value, and the second is the finance approach, which estimates the market value. As you can see, the first method takes the difference between the assets and liabilities on the balance sheet and arrives at a value of $70,000. In the second method, an analyst builds a DCF modelDCF Model Training Free GuideA DCF model is a specific type of financial model used to value a business. DCF stands for Discounted Cash Flow, so the model is simply a forecast of a company’s unlevered free cash flow discounted back to today’s value. This free DCF model training guide will teach you the basics, step by step with examples and images and calculates the net present value (NPV) of the free cash flow to the firmThe Ultimate Cash Flow Guide (EBITDA, CF, FCF, FCFE, FCFF)This is the ultimate Cash Flow Guide to understand the differences between EBITDA, Cash Flow from Operations (CF), Free Cash Flow (FCF), Unlevered Free Cash Flow or Free Cash Flow to Firm (FCFF). Learn the formula to calculate each and derive them from an income statement, balance sheet or statement of cash flows (FCFF) as being $150,000. This gives us the enterprise value of the firm (EV) which has cash added to it and debt deducted from it to arrive at the equity value of $155,000. It is very common for this market approach to produce a higher value than the book value. Thank you for reading this guide to understanding what equity is and how it works.